When Holly Holm took center stage Saturday to defend her brand new bantamweight title against Miesha Tate at UFC 196, it was hard not to notice the elephant that was not in the room. Former UFC bantamweight champion Ronda Rousey’s presence was felt, even though she wasn’t even in the building. 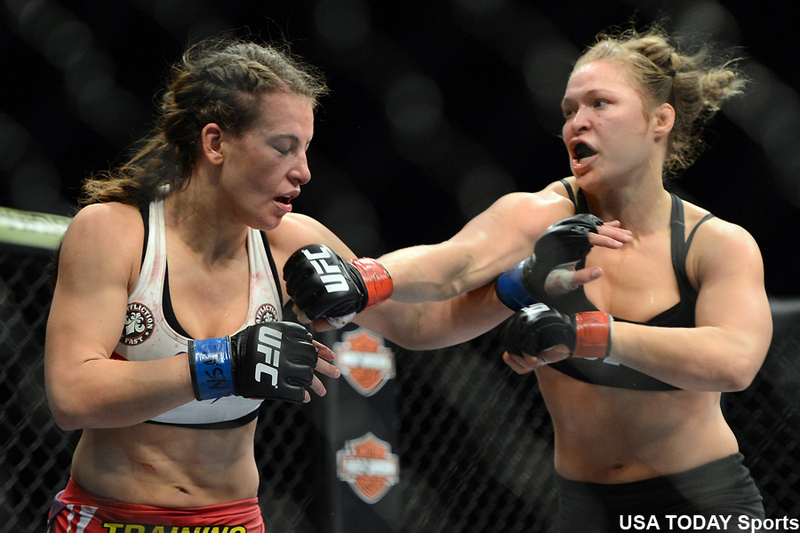 It was understood that a life-changing payday in a rematch against Rousey awaited Holm if got past Tate. However, Tate threw a rear-naked monkey wrench into those plans by choking Holm unconscious in the fifth and final round to claim the ever-elusive UFC belt. Now it appears Tate will score the financial windfall that comes along with welcoming Rousey back to the cage. As you might recall, White promised Tate a third fight against Rousey after beating Jessica Eye last July. However, Tate woke up one day and turned on “Good Morning America” to discover White decided to pull her from the bout in favor of Holm. Tate was so discouraged, the 29 year old contemplated retirement from MMA. Holm went on to embarrass Rousey to claim the bantamweight title in November, while a disgruntled Tate watched from her couch. Fast forward four months and now Tate finally gets a third tango with her bitter rival, only this time she’s the one sitting atop the throne. Rousey didn’t watch her bitter rival choke Holm out on Saturday, but White did update her via text. With two movie projects on deck, Rousey isn’t expected to return to MMA until October at the earliest. Tate has at least seven months to figure out how to save her arms.